For this shot I had to test new features of Pulldownit 2.7, specially transition animation-dynamics capabilities. 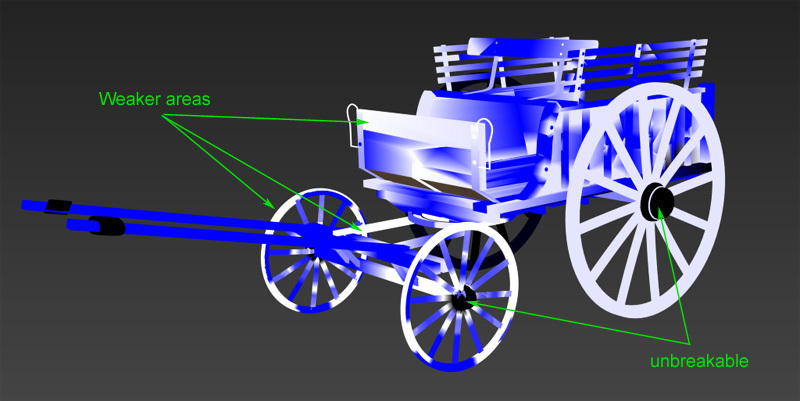 I needed and animated model made of diferent pieces and break it upon collision, Pdi wood shatter works very nicely so I decided to try with a cart, besides I had modeled a horse sometime ago so it was perfect for attaching the cart to it. The hair of the horse was created with the Hair and Fur modifier in 3ds Max. The render mode of the hair was “geometry”, in order to get the depth of field of the Vray Camera rendered fine. The animation was made using the live mode dynamics. To build the cart I used some vintage photos as reference. The model is made of diferent pieces and single planks in order to not having issues when shattering it, the fence was built in the same way. The cart was rigged in two parts; one attached to the horse and another one more “free”, so I can introduce some noise in the animation when the cart is running fast over the irregular terrain. I used a couple of dummy objects attached to the geometry to drive the motion of the car straight toward the fence and secundary motion with the terrain slopes, the front and rear wheels where grouped separately to make them spin around its axis. I used some vray dirt in the material diffuse so that we can have a stronger ambient oclussion look. Vray ambient oclussion was checked too. I needed different parts of the cart to break different, I mean, wheels should break different than the deck of the cart for example, so first thing I did was separate the parts of the cart in different layers, chassis, front wheels, rear wheels, seats, and so on..then I started to shatter geometry per layer, making sure the active layer was the same of the current shatter operation, cart deck and footrest were shattered using wood style the rest of the cart was shattered using uniform style in a few fragments, 8 or so. Pdi 2.7 kept the animation of the parts after shattering, that worked perfect. I created a fracture body per layer, in this way I could control the fracture of each part independently, as the cart is animated I set each fracture body as static and activation at frame in order to force them following the animation until colliding with the fence, I reduced clusterize to 0.0 and set local propagation far all pieces. Finally I used PDI advanced fractures to prevent some parts to break at all, the axis of the wheels, and most part of the deck and one of the rear wheels doenst break because of this. For fine tuning of fracture and adjunsting the strenght of impact I tweaked hardness and damping parameters of each piece interactively, for doing it I hid all layers except the one I was computing, Pulldownit seems to get along very well with layers. When I was happy with the way each piece was fracturing I simply unhid all layers to bake the final result.